FILE - Ex-Massey Energy CEO Don Blankenship leaves the courthouse in Charleston, West Virginia, Oct. 1, 2015. Sitting in court since early October, spectator Judy Jones Petersen has heard plenty from the defense about a former coal CEO's safety concerns but not much about how 29 men died – including her brother – in a fiery mine blast under that executive's watch. Petersen, a physician from Charleston, realizes former Massey Energy CEO Don Blankenship is not on trial for killing those coal miners, or causing the 2010 explosion at Upper Big Branch Mine in southern West Virginia. Judge Irene Berger has emphasized that point to jurors. Instead, prosecutors say Blankenship imposed a profits-trump-safety corporate mentality that could let a widespread disaster occur. He is charged with conspiring to break safety laws at the mine and lying about company safety efforts to investors and financial regulators. While prosecutors pressed rare criminal charges against a top executive of a large, publicly traded company, the case has effectively kept details about the deadly explosion muzzled, obscured and mostly unmentioned to jurors. 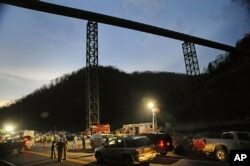 The deadliest U.S. mine disaster in four decades has been fleetingly referred to as “the explosion,” used as a reference point in time, then mentioned no further. Blankenship's attorneys, meanwhile, used hundreds of documents to suggest he prioritized safety, but the company was hampered by spiteful federal regulators and hard-headed coal miners who wouldn't follow instructions. They used a key government witness who headed a Massey subsidiary that oversaw Upper Big Branch, Christopher Blanchard, to say safety was important to Blankenship. FILE - West Virginia State Police direct traffic at Massey Energy's Upper Big Branch Coal Mine in Montcoal, West Virginia, after 29 coal miners were killed in the April 2010 explosion. Since Oct. 1, Peterson and a few other relatives of victims have walked through the same Charleston courthouse doors as the man they want imprisoned – sometimes right beside him – without picketing or confrontations. Now, the family members are a consistent, quiet presence in court. Sometimes, just a handful attend; other times, a dozen or more. It's been a test of patience, occasionally prompting a tear or trip out of the courtroom to cool down. Almost immediately after Blankenship was indicted in November 2014, the judge ordered family members and everyone else linked to the case not to discuss it with the media. A higher court overturned the ruling after news outlets challenged it. Blankenship's multimillion-dollar defense argued he could never draw a fair jury without going to West Virginia's Washington, D.C., suburbs or leaving the state. The families say they have taken extra care not to bring attention to themselves in the proceedings, even watching their facial expressions. “You don't want to do anything to jeopardize this,” said Shirley Whitt, whose brother Boone Payne died in the explosion. Blankenship's top attorney, William Taylor, told jurors in his opening statement “there's no secret that the Upper Big Branch mine had a terrible tragedy and 29 men lost their lives.” Weeks later, the jury has heard essentially nothing about how those miners died. Petersen said she was in disbelief when the defense rested Monday without calling a single witness. But she was hopeful about the upcoming verdict.